While my girls were with their grandparents last week I got so much back-to-school shopping accomplished. But not just for them – I found some fun back to school things for myself as well! Nordstrom had recently asked me to explore their designer department so I had the time to browse through their exquisite selection and daydream about some of my favorites. I can’t wait to show you what I found. 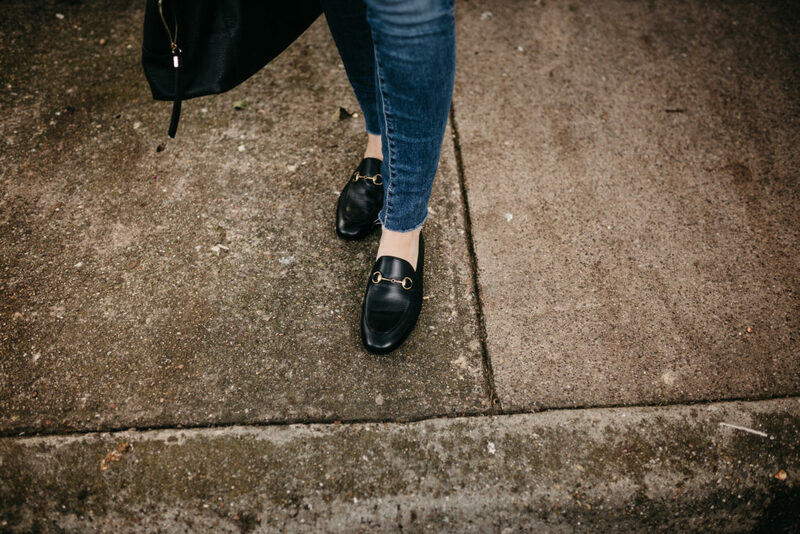 My fall “#momuniform” is not revolutionary: jeans, a white blouse or tee, an easy cardigan, and some amazing flats is something you will see me in a lot. So easy and so classic, don’t you think? I think these loafers fit those criteria. The Gucci mules have been a blogger fave as of late, but I don’t like to be like everybody else. 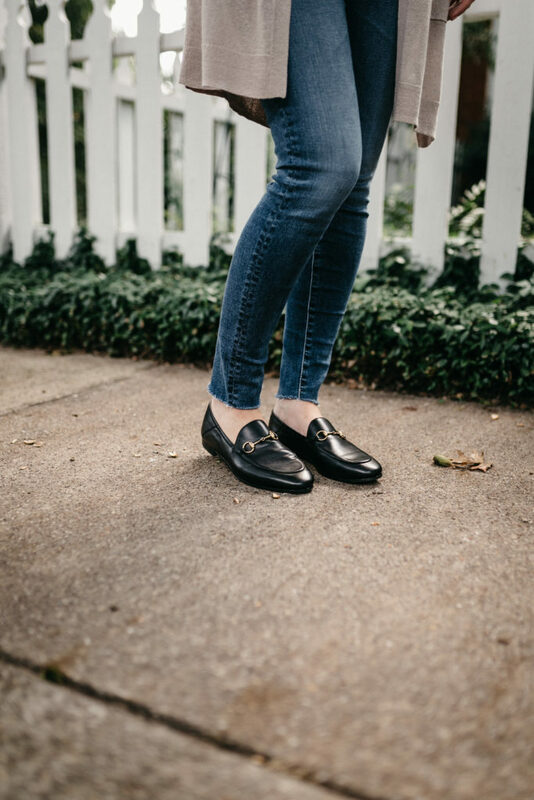 So I chose the loafers and they are so comfortable and I think more practical year round. What’s so neat is that you can push the back of the shoe down and wear them as slides. I promise I am not making this up! The sales associate told me this and you can see it on the product description. It’s like two shoes in one. So what other designer items am I drooling over right now? In keeping with those same criteria, here are some timeless things from Nordstrom I would love to add to my closet (you know, if I had a limitless budget! ): Valentino rockstud sandals (these are amazing and you can wear them all year long), Classic Chanel two-tone flats that never go out of style or Chanel’s pearl mules (both available in select Nordstrom stores), this Fendi bag, Christian Louboutin pumps (these are new ones for fall), this mini Gucci shoulder bag, and, if I thought I could pull it off, this Gucci belt. 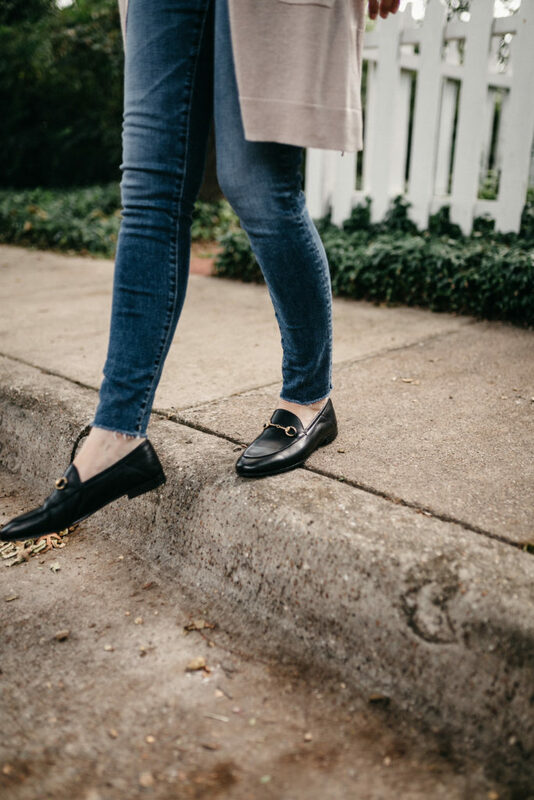 (I’ve seen chic Dallas women wearing these belts lately and it definitely makes jeans and a crisp blouse with the collar popped look AH-MAZING ….and would be such a WOW gift idea now that I think about it). What designer things are you daydreaming about or asking for your next birthday? I would to know! Thanks so much to Nordstrom for sponsoring this post! As always, all outfits and opinions are my own. Everyday Fall Outfits with 11 Key Pieces from the Nordstrom Sale! Nordstrom Sale: In Stock Favorites!